Please plan to join us Friday, June 13 for our first annual Mass and Reception for the Renewal of Wedding Vows. Mass at 7pm, reception to follow. RSVP no later than Monday, June 9 to the parish office. 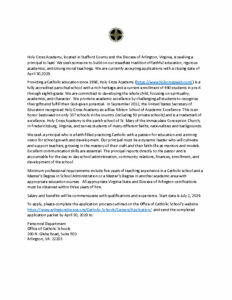 Religious Education Registration for the 2014-15 school year begins Monday, June 2 in the parish office. Join our annual observance of the Week of Prayer for Christian Unity, this Tuesday, June 3, at the Fredericksburg United Methodist Church, 7pm. Meet our new Parish Nurses and learn more about our new Parish Health Ministry after Masses next weekend: 6-6:30pm on Saturday and 8am-4pm on Sunday, outside church or in Courtyard Meeting Room, depending on weather. SHARE Food Orders for June are due on the 16th. Please see the order form, p. 17.